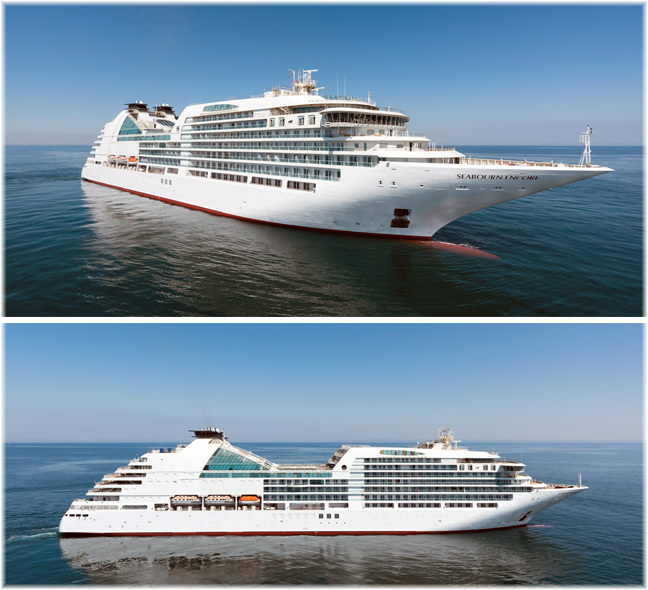 Recenly delivered in Italy, Seabourn’s new 600-berth Seabourn Encore, the line’s biggest ship since the 793-berth Seabourn Sun (1998-2002), has now joined the Seabourn fleet and is on her way to Singapore for her christening by Sarah Brightman. Meawnhile, the Royal Caribbean and TUI-affiliated UK arm of TUI Cruises will have three ships in the Caribbean this winter, with flights by Thomson Airways from a network of ten UK airports. And a week after the announcement of the disappearance of Fathom as a ship operator comes news that a longer-established brand, Croisières de France, is also being assigned to the dustbin of history. On Thursday, December 1, Seabourn took delivery of its newest all-veranda all-suite vessel, the 600-berth Seabourn Encore, in an official handover ceremony at the Fincantieri shipyard in Marghera, Italy. “The jewel we deliver today is the first built for Seabourn, and drydock works for the second vessel of this new and prestigious client will start in the next few days in our shipyard in Sestri Ponente. I say this with a certain pride and a lot of satisfaction, because Seabourn represents the top range offer of the Carnival Group and Fincantieri is now identified as an absolute reference point from the market, able to offer tailor-made products to an ever wider range of customers,” said Giuseppe Bono, ceo of Fincantieri. Designed by hospitality designer Adam Tihany who intended that Seabourn Encore “feel more like a luxury yacht,” the 40,350-ton vessel features an additional deck and newly-expanded public areas. 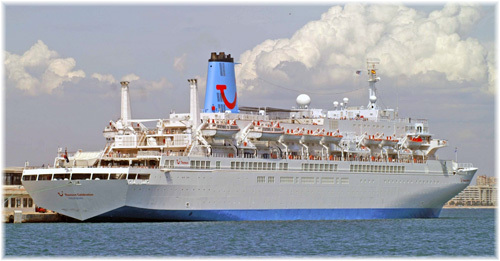 The ship expands and builds on the line’s highly acclaimed “Odyssey” class ships, introduced between 2009 and 2011. New features include The Retreat, a sanctuary designed for guests to relax in private cabanas. This facility has been adapted from sister brand, Holland America Line. Cuisine includes The Grill by Thomas Keller, a new signature restaurant from three-star Michelin chef Thomas Keller that was introduced on Seabourn Quest earlier this year and will be expanded to the entire Seabourn fleet. A new restaurant for Seabourn, Sushi, makes its debut, with a unique look and feel and high-quality dishes served throughout the day. Seabourn Encore will be officially christened at a ceremony in Singapore on January 7, 2017, where Sarah Brightman will act as godmother. The vessel will then depart on its Inaugural Voyage, a 10-day Gems of the Java Sea cruise, bound for Indonesia. Following her inaugural sailing, Seabourn Encore will move onto a 16-night Great Barrier Reef & Gold Coast and back-to-back 16-day Australia & New Zealand voyages. The ship will then sail back along the earlier 10-night Gems of the Java Sea cruise to Singapore, proceeding on a 16-day Jewels of India & Arabia cruise to Dubai, and then a 19-night Arabian Gems & Holy Land voyage before ending her winter season at Athens on May 5, 2017. For the first time this winter, Thomson Cruises will base three ships in the Caribbean. The all-inclusive 1,800-berth TUI Discovery will be based in Barbados, while sister ship TUI Discovery 2, joining the fleet next summer, will sail out of Montego Bay on cruises that will also include overnight stays in Havana. Meanwhile, the 1,254-berth Thomson Celebration will move to a new home port, La Romana in the Dominican Republic, where passengers will be able to combine their cruise with a stay at the Sensatori Resort in Punta Cana. Direct Thomson flights will take customers to the Caribbean from Cardiff, Doncaster Sheffield, East Midlands, Glasgow, Newcastle and Stansted airports, as well as existing flights from Birmingham, Manchester and Gatwick. Back in Europe, the 1,506-berth Thomson Dream will be based in Tenerife and Gran Canaria, from next November. The 1,462-berth Thomson Majesty and 1,254-berth Thomson Spirit will then leave the fleet in November, possibly to operate from Celesytal Cruises. Pullmantur Cruises is expected to close the Paris offices of its Croisières de France (CDF) brand by the end of February 2017. With about 100,000 cruise passengers per annum, Croisières de France was the fourth largest cruise line in France, after Costa Cruises, MSC Cruises and CroisiEurope. Pullmantur was taken over this May, when Springwater Capital took a 51% controlling interest in the Madrid-based company. And with the naming of Richard Vogel as president and ceo of Pullmantur Group, the company had already started to look at its aims. Vogel’s background was first with AIDA and then with TUI, both of which built their success on focusing on a single market. So Pullmantur is now refocusing its efforts on Spain and Latin America. France will remain a core market, but without the 100% dedicated French ship that is has had in the past. Cruises will now be marketed in France on Pullmantur’s Spanish identity ships with bookings handled from Madrid rather than Paris. Pullmantur has already abandoned 100% French cruises and instead sailing the two CDF ships under the Pullmantur brand, French cruisers will now join one of the four-strong Pullmantur fleet. Further to this, cruises to Northern Europe will no longer sail from Calais, which has been replaced by Rostock because of more efficient airlift and transfers from Spain. CDF launched service as a subsidiary of Royal Caribbean Cruises with the Bleu de France in 2008. That ship was replaced by the Horizon, transferred from Pullmantur Cruises in 2012, and the Zenith was added in 2014. All told, about 33 personnel will be affected in France. Some of these may find work with Pullmantur in France, working on business such as group tours from Tour Hebdo. Sales arrangements will also change in Belgium, Switzerland and Luxembourgh as the Pullmantur distribution system is adopted.